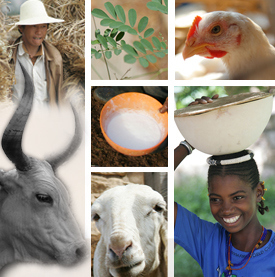 This poster, prepared for the ILRI@40 series of events, explains farming systems analysis and modelling research by the Livestock Systems and Environment group at the International Livestock Research Institute (ILRI). This research deals with questions such as: Can we identify robust interventions that cut across systems and socio-economic scenarios? Can we upscale strategies to quantify investment needs in interventions? The research uses a circular approach in which participatory evaluation of methods and indicators by local experts and farmers and current analyses focusing on the quantification (components) of food security across a wide range of systems in the developing world. Tags: poster. Bookmark the permalink. Previous post ← What is needed to reduce the greenhouse gas footprint of livestock?